God raised up Blessed Frederic, setting him ablaze with the spirit of His love, to encourage groups of lay people in the service of the poor. He was a professor who upheld and communicated the faith through teaching cultural subjects. He also took up journalism and founded a newspaper. He received the degree of doctor of law and was a leading historical and literary critic in the neo-Catholic movement in France during the first half of the 19th century. He was a married man, an excellent father, and he made his family into a small church. His short life was extremely busy with his professorial duties, his extensive literary activities, and the work of district-visiting as a member of the society of St. Vincent de Paul. His political writings in support of the Catholic Church and his work with the poor in the urban slums of Paris are still very relevant and inspiring to us today, almost 200 years later. His writings pre-dated and formed much of the groundwork for the Catholic Social thought of the modern era. Christian discipleship demands direct involvement in the critical issues facing our society. The poor are the sacred image of God whom we do not see, and being unable to love in any other way, we love Him in their persons. Since a large part of humanity is poor, and since nature itself is poor in so far as it is liable to death, if we are to become saints we must also wish to be poor. It is a characteristic of love to wish to be like, as far as possible, what is loved. Each one of us carries in his heart a seed of holiness which, by our merely wanting it, can bloom. Source: Letter to Louis Janmot, Nov. 13 1836. From Les lettres de Frederic Ozanam: Lettres de jeunesse, pp. 243-244. Soon after arriving in Paris, Ozanam distinguished himself both in the classroom and in extracurricular debates as a formidable intellectual force, who combined encyclopedic knowledge with incisive logic and unparalleled reasoning skills. He also quickly assumed a leadership role among a minority of Catholic students who were keen to defend their faith in the hostile and oppositional climate of the time. Ozanam had a burning passion for intellectual debate, and this hunger drove him to organize colloquia in which he could engage faculty and fellow students in lively discussions concerning a very wide ranging sample of topics. With the help and mentoring of his good friend Emmanuel Bailly, the editor of La Tribune Catholique, who agreed to act as host, Ozanam gathered a group of scholars for regular ongoing debates in what would become known as the Conference of History. It quickly became the tradition of the Conference of History for the debates to ultimately settle on the relative merits of the Catholic faith in relation to whatever historical topic was being discussed. Ozanam and his compatriots would defend Catholicism, while other groups would represent the more mainstream intellectual position that the Church was generally a corrupt, oppressive and retrogressive force in history. One fateful day, in the middle of one such debate, Ozanam was challenged by a fellow student to provide evidence that the Church was a benevolent force, to which he replied by reciting a litany of events in Church history that highlighted ways in which the Church had unequivocally made the world a better place. Ozanam’s opponent was not satisfied and argued that the Church might have been a good force at one time, but questioned how it could be construed as a positive contemporary force. When Ozanam arrived in Paris in 1831 at the age of 18, the Catholic Church was viewed by a majority of his professors and peers at the University of Paris as hopelessly conservative and mired in medieval nostalgia. Universities like Paris and the Sorbonne were seedbeds for liberal democratic philosophies and progressive political organization. Catholicism was openly reviled and denounced. Lectures in Paris, in a variety of disciplines, normally included some mention of the ways in which the Church had been a detrimental influence on society and the individual, and how modern French society needed to liberate itself from this stifling and oppressive ecclesial yoke. Ozanam entered this fray and quickly distinguished himself as an articulate defender of the Church. Over the next eighteen years, until the revolutions of 1848, Ozanam would plant some of the first seeds that would eventually blossom into the Church’s social theory some sixty years later. When Ozanam was challenged by his peers to demonstrate how Catholicism was changing the lives of contemporary Frenchmen, he instinctively understood this as a challenge to both his own insulated and comfortable existence, as well as the Church’s own aristocratically coddled position in French society. He interpreted the challenge as one that called him out to the dirty, garbage-strewn ghettos of Paris where he and his friends would encounter the very real human byproducts of industrial capitalism. He could have chosen to interpret this challenge differently: as a call to be more pious, more liturgically oriented, or more involved in the political machinery of the Church and its relationship to the State. All of these would have been valid responses to such a challenge. However, Ozanam chose an option for the poor instead, which distinguished him from other Catholic charitable outreaches of his day. He prefigured the kinds of preferential options called for a century later by liberation theologians, and eventually by the Pope himself. The Church, according to Ozanam, should not be standing on the sidelines, or worse, allying itself with oppressive and anachronistic powers that were perpetuating the suffering of the people. He was also convinced that this call to discipleship was not reserved for a few elite individuals who constituted a professional clerical class within a larger, passive Church, but rather, was a call that went out to all Christians, sacerdotal or lay. Service to the poorest of the poor was, for Ozanam, the clearest and most compelling sign of Christ’s presence in the life of the Church. This kind of service was not something that could be accomplished by proxy, as if Christians could hire this task out to someone else. It was the kind of service that required direct immersion by all Christians in the lives of the poor and suffering. Because we are young, because we are not wealthy, we can more easily fill the role of mediators, which, as Christians, we should consider obligatory. That is the possible usefulness of our Society of St. Vincent de Paul. The problem which divides people today is not a political problem, it is a social one. It is a matter of knowing who will get the upper hand, the spirit of selfishness or the spirit of sacrifice; whether society will go for ever increasing enjoyment and profit, or for everyone devoting themselves to the general good, and above all to the defense of the weakest. The saints were out of their minds when it came to love. Their love was limitless, embracing God, humanity, nature. […] And so, my dear friend, are we not going to do anything to become like those saints whom we love? 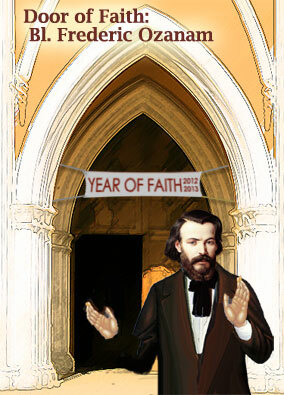 Frederic Ozanam- A Layman for Now by Shaun McCarty, S.T.